Hello my fellow nail art enthusiasts! 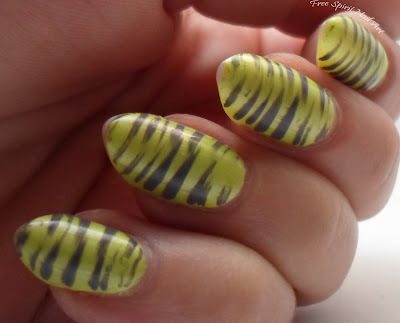 Today I'm sharing with you my fishing lure nails! This is not what I intended them to be but after you hear my story it'll make sense! I couldn't decide on a design so I caved and went with what's super quick and easy...which is to use a fan brush to create the above pattern. 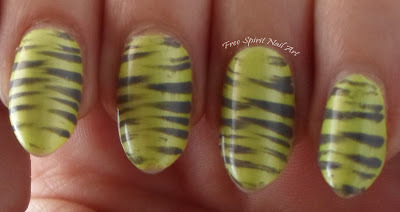 Now on to why I'm calling this my fishing lure nails! I went on an impromptu camping trip with my love for a much needed break to play in the woods and while camping we went swimming in the lake by our campsite....do you see where this is going yet?...lol...so after a few minutes we see a tiny silver something jump up in front of us (we were about chest deep at this point) and was like "was that a fish? "...then another two jumped...then nothing for a few minutes...then several started bumping into both of us at the same time nibbling at anything they could reach! They were too tiny to hurt but it sure did startle us! Then it dawned on me that in the muddy water my nails have the same pattern as several lures I've used before! The actual color I used is L.A. Colors Lime Life and a dark gray I mixed at home using old black and white polishes I had laying around. Please excuse the tip wear as these were taken once I got back from camping! And I have to admit that I got compliments on my nails even while camping! The lady at the camp site gate really like them! It just reinforces to me that this is the industry I need to be in! Thanks for stopping by and share it if you like it!